Sliding snow and ice can cause personal injury and property damage. Prevent this dangerous occurrence by installing Snow Guards. 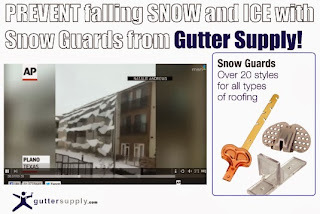 Snow Guards help keep snow and sheets of ice from sliding off of the roof by keeping them in place on the roof and having the sun slowly melt them away. Snow Guards are relatively inexpensive and easy to install. A simple measure to protect people from injury and property from damage.